The wheel of the year had turned and the first harvest festival was upon us. 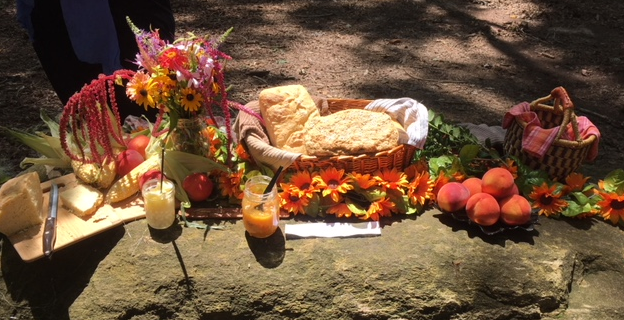 During our annual celebration of Lughnasadh this year we celebrated community, vulnerability (although nobody really planned for that to happen), the magic of bread, and the deities of grain found throughout the world. Traditionally this festival was held in August to mark the first harvest of the wheat or grain crop and celebrated the Celtic Sun God Lugh. There were festivals and games in honor of his foster mother Tailltiu, who sacrificed her life to clear the fields of Ireland for agriculture. Our ancestors knew the purpose of the harvest. The harvest was a sacred time to gather, to work, to come together, and to share. Historians have looked at the festival Lughnasadh and noted that the period before it was probably a time of much scarcity within communities. The harvest is sacred. We need what the harvest will give us. We need food to sustain us through the coming Winter. So how do we get it? Our ancestors knew that the harvest time was not a period of rest and relaxation. The harvest was work. The harvest meant getting your scythe, going out into the fields, and doing the job that needed to be done. It meant being willing to get sweaty, to be bitten by bugs, to get blisters from the tools you used each day. What is the Harvest that is coming up in your life? What is the Universe making available to us? Or conversely, what are you willing to seek out this harvest season? What task or skill do you want to cultivate? What behaviors do you want to change? What harvest are you hoping to reap the fruits of this fall? If we want a good harvest, we have to ask ourselves: what are we willing to do about it? Our ancestors knew the secret of the harvest: if the grain was ripe and no one went out into the field to collect it, that meant there would BE no harvest. No grain collected, no flour, no bread, no survival. The universe, the hospitable earth, the gods and goddesses can provide a lot for me, a lot of beautiful opportunities. But if I’m not willing to get my hands dirty and work during the harvest, I can’t expect any of the rewards. Our community came together to share their hopes, their fears, and their dreams for the coming harvest period. I was so impressed by our beautiful members who courageously opened up to each other about what was really going on in their lives. I was inspired and touched by the stories I heard about people doing things they were afraid of, of people taking time to care for themselves, and of people trying new things! We have a wonderful baker and Council Member here at CotE, George, who baked the cakes and ale for our ritual and prepared homemade peach and berry jams! He asked for blessings for the harvest, and during this time Liz, another beautiful Council Member here at CotE, read “The Little Red Hen”, reminding all of us that those who do the work reap the reward. After this time of open sharing and community, we thanked the elements, the grain deities from around the world, and those who wished to participate made offerings of bread to the local land spirits. The first harvest festival reminded us of the power of community and shared vulnerability, and personally helped me to feel a lot stronger going into the coming period of activity and effort.